Bill Evans is often described as self-effacing. He worked very hard at his art and never considered himself a gifted pianist. Yet his innovative voicings and his introspective but emotionally rich style influenced generations of musicians. Peter Pettinger in his biography Bill Evans: How My Heart Sings says, “Evans...created an entirely individual harmonic language as estimable in its thoroughness of working as those of, say, Gershwin, Messiaen, or the neoclassical Stravinsky.” Despite the complexity of his playing so admired by musicians, his music is enjoyed by listeners on every level. Evans began playing by age three and started formal studies at six. He also learned violin and flute and familiarized himself with 20th century classical composers by playing through his mother’s piles of sheet music. He received his degree in music in 1950 and after serving in the Army decided to pursue music professionally. He moved to New York City where he joined the group of George Russell who introduced Evans to the “Lydian Chromatic Concept of Tonal Organization,” a new harmonic concept that would be pursued by Miles Davis. Evans recorded his first album as a leader in 1956, New Jazz Conceptions, a critical but not a commercial success. In 1957 Davis, who was looking for a pianist familiar with modal music, asked him to join his group. In turn Evans introduced Davis to contemporary classical composers and wrote “Blue in Green” during this period. Although Evans was in the group (which included John Coltrane) for less than a year, he returned to record some of the material for Davis’ Kind of Blue album. 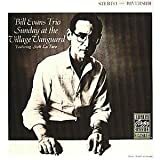 In 1958 Evans recorded his second album as a leader, Everybody Digs Bill Evans, which included his composition “Peace Piece.” By 1961 Evans had found an ideal trio in drummer Paul Motian and bassist Scott LaFaro. Their work was distinguished by the equality of the musicians’ roles and their resultant interplay. This trio, according to bassist and author of The Jazz Bass Book: Technique and Tradition John Goldsby, “...changed the sound of jazz. For the first time, three musicians were improvising contemporaneously to create a conversational sound.” Their live performances at the Village Vanguard produced some of Evans’ best work, including Waltz for Debby, the title cut of which would become a jazz standard with lyrics later added by Gene Lees. Unfortunately, on July 6, 1961, eleven days after completing the recording of the Vanguard sessions, LaFaro would die in a car accident, and a grieving Evans wouldn’t record as a leader for another year. Although Evans preferred the trio format he recorded some memorable sides with guitarist Jim Hall, harmonica player Toots Thielemans, vocalist Tony Bennett, and with a symphony orchestra conducted by Claus Ogerman. Evans’ struggles with heroin addiction came to a head around 1970 when he entered a methadone program and remained clean for several years. However, he later picked up a cocaine habit.